I had to take a long breath when I saw the name of this book in the drafts folder of this blog. It has been almost three months since I finished When Genius Failed and in that time a lot has happened. I did an internship, I volunteered at a start-up event and, finally, took a little vacation. And now, with the title of the book staring at me from behind a monitor, I realize that I remember very little of what happened in this non-fiction finance thriller. Or perhaps "thriller" is too strong a word. The main characters here are hardly relatable enough to raise feelings of empathy. These are men who have made fortunes through arrogance, guile and occasional backstabbing. They make a series of foolish decisions and are ultimately undone by what amounts to a combination of hubris and bad luck. When Genius Failed is, apparently, considered a classic of a genre of non-fiction that I might describe as financial failure. So many distinguished books have been published in that category lately - Too Big to Fail by Andrew Sorkin and The Big Short by Michael Lewis to name a few - that I feel Genius barely makes it into the top ten today. This does not mean that it is in any way a bad work, on the contrary. It is only the competition that has upped its game. 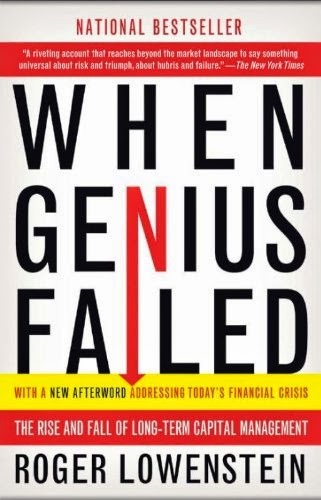 When Genius Failed is the story of Long-Term Capital Management, a hedge fund that promptly fails to live up to any of the statements in its name. The highlights of the story include John Merriwether and Myron Scholes, executives of the company who held hallowed positions in finance hall-of-fame. They lost it all in spectacular fashion and Scholes, of Black-Scholes formula fame for those in the know, saw his Noble awarded work in finance greatly devalued. A nice read, but not one I would recommend to anyone off the top of my head.